Over the holiday break I revisited the San Francisco Bay Area to see what its cities had built to attract creatives and entrepreneurs in the eight years since I last lived there. Here’s my basic assessment based on what’s under construction – the East Bay will have the greatest population gain in this group by far, San Francisco will continue to attract them as well albeit at a much slower pace, and the West Bay/Peninsula – the heart of Silicon Valley – will continue to become a community for executives and only the most established high tech companies like Xerox, HP and Apple. Why? Affordability and quality of life. The Peninsula is simply too expensive, too low in density, and too congested to provide attractive housing or office space for entrepreneurs starting their own companies. While the real estate in SF is just as high, the higher densities and prolific amount of development allowed in the industrial districts now being transformed, such as in Mission Bay, should relieve some of the demand that is exceeding the supply of housing and office space. However, the East Bay is still close enough to SF nightlife, yet far away and dense enough to remain affordable, a wise investment for someone buying a home or starting a new company. 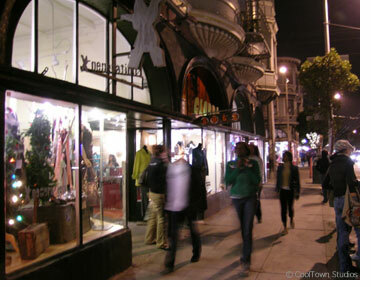 However, as far as measuring the neighborhoods with the coolest restaurants, coffeehouses, lounges, shops and overall vibe, one still can’t compete with SF’s neighborhoods, such as the Haight (pictured) and the Mission… and unfortunately, it doesn’t look like other cities are trying very hard (or know how) to match it. This article makes sense at first read, but elsewhere on this page you have another one crediting Silicon Valley towns as the “Most Inventive Towns in America,” in part because their high quality of life makes them attractive to mobile technology workers. Since I also support infill development, please consider this the Devil’s Advocate position: wouldn’t Peninsula towns claim that their growth controls and single-family homes are what makes their “quality of life” so high? Also, East Bay nightlife can often leave SF nightlife in the dust. Silicon Valley used to be more affordable many decades ago when the HPs and Apple’s were just starting, but they maintain a present quality of life aided by weather, proximity to SF, fantastic recreation, a progressive culture, and deep access to high-tech jobs, despite the high housing costs brought on by low-density, single-family neighborhoods.